In 2006, SAFTIFIRST was the first company to introduce a complete fire resistive and hurricane rated wall and door assembly up to 2 hours. The SAFTIfire Hurricane system has a maximum design load of +/- 80 psf, complies with Florida’s HVHZ testing standards, has Florida Product Approvals for 60 to 120 minute wall/window assemblies (FL 16382), 60 and 90 minute single and pair doors (FL 1688), and meets ASTM E 1886, ASTM E 1996, TAS 201, 202 and 203 standards. This system has also been tested to Miami Dade standards and is UL listed for Wind-Resistant Building Components (R25144). The glazing is comprised of SAFTIFIRST‘s clear fire resistive SuperLite II-XL insulated with 9/16″ DuPont Sentry Plus Laminated Glass. It can be further customized to include energy efficient, decorative or sound attenuating make-ups. The frames are offered in standard and custom finishes including high performance fluoropolymer finishes by PPG, clear anodized, bronze anodized, black anodized, Decoral ®, ornamental metal, and more. In addition, the SAFTIfire Hurricane system is enrolled in Architectural Testing Inc.’s Quality Assurance Validation Program. This innovative product provides a breakthrough for designers who, in the past, either put fire shutters on hurricane impact glazing, or put hurricane shutters on fire rated glass. The SAFTIfire Hurricane system removed the need for any shutters, which have their own set of drawbacks. 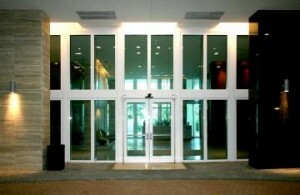 They are unsightly, expensive and can block natural light into a building. Hurricane shutters also require maintenance between uses and can fail when needed because high winds can block deployment. While there is a premium on this specialized product, there are often cost savings overall because there’s no need for duplicative systems (e.g., shutters, two side-by-side assemblies) and insurance premiums can go down by about 10 percent.